The sun has melted today’s light layer of frost from the still green grass and shrubs. I read a brief article in the paper a couple of days ago that our autumn is protracted this year because it started out and stayed mild for so long. I read a different article early last month that predicted a cold and snowy winter (of course I believe that was the prediction for my area last year too, which was far from the truth). Cold is coming. 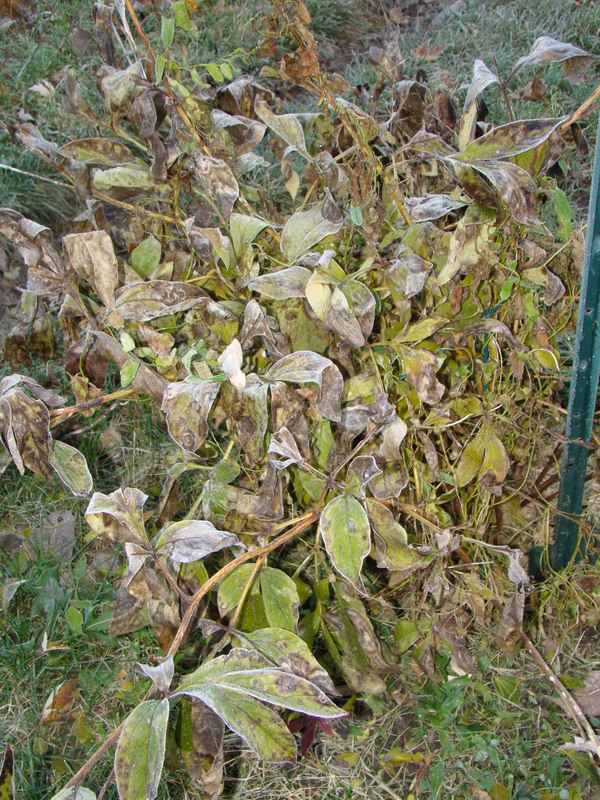 Frost on dying peony leaves. I’ve lived in places that experience all four seasons for most of my life and I do like three of them – it is a toss-up whether spring or fall is my most favored. But I haven’t ever been a fan of winter with its limited color palette; difficulty in getting around in snow, ice and slush; few hours of daylight; and nippy temperatures. I can only think back on a handful of times in my life that I enjoyed winter – a few blissful afternoons sledding with friends, learning to ice skate, and the stark beauty and silence of a frigid winter night with the crunching crust of snow underfoot as almost the only sound. Certainly joyful things have occurred in winter months, but these were not dependent upon the winter weather as part of their charm. We humans like to make adjustments to our general environment to suit our own needs, so in my imaginings I have wiped away winter. But the wild green growing things that are now settling into dormant slumber need this respite to thrive. And I can’t deny them this necessity since they offer me so much the other 3 seasons of the year. I am therefore, deeply grateful that I live in this age of central heating with programmable thermostats – allowing for a comfortable room temperature when it is time for me to get up in the morning. I wince at the discomfort for our ancestors who had to gather their fortitude just to get up and start a fire to be warm. I appreciate that we have holidays during these cold months which will add splashes of color to the whites, browns and tans nature offers – red and green for Christmas, more red for Valentine’s Day. Colors are important for visual interest and stimulation. Not to mention how they can affect mood. Every year at this time I watch the birds fly south (I walked past a tree full of songbirds the other day, probably the last for a few months) and wonder how I might do the same. I read about the animals who hibernate, and have been dodging all the squirrels frantically preparing for their long sleep, and wonder if that might be my solution. Knowing that neither option is viable for me, but wishing all the same. Perhaps you will help me to pass the time, and make it worthwhile, through this cold and dormant season? Every year I say that I will research snow blowers and buy one. And every year I don’t get around to it… I really have to figure this out. To combat the lack of light, a few years ago I bought – and have really enjoyed – the Philips brand Happy Light, which slowly illuminates in the morning so that by the time the alarm sound comes on (I have birds), there is some type of light in my bedroom, which makes the winter mornings less imposing from the first moments of consciousness. Finally, I always remind myself that the extended periods of cold are the reason why we don’t have Really.Big.Bugs nor scorpions. Bugs get one season here, and that is it. You got me with the Really.Big.Bugs part! Very good point. I’m not a fan of them. The question is which one I dislike more. I agree about the importance of light, though I’ve never bought one of the special lights.